On the eve of the release of his 101st feature – the young-love story, ‘Poi’ – director K Balachander talks about the journey from then to now. By the time I came into films, I had become very popular as an amateur playwright. I was known in the film fraternity, and MGR asked me to write the screenplay-dialogue for his Deivathaai. Very frankly, considering the nature of MGR movies, I was a fish out of water, but the producer, RM Veerappan, helped me. He was adept at writing scripts for MGR. After that, I wrote Poojaikku Vandha Malar for Muktha Srinivasan. Then I got a producer for my first movie. At that time, most films were based on heroism. They were all male-oriented, male-chauvinistic films. I knew I had to be different, so I chose the area I knew best – middle-class issues. I decided to remake Neerkumizhi, one of my favourite plays. Compared to the other films of the time, it was something new for the audience. It was shot mostly on one set. The concept, the structure appealed to everybody. It became a big hit, and I became a film director. These women-oriented films usually have tragic endings. You put these women in interesting circumstances, but they somehow fail to find happiness. Sujatha in Aval Oru Thodarkathai, Suhasini in Sindhu Bhairavi, Pramila in Arangetram – their characters seem abandoned at the end. In Sindhu Bhairavi, Suhasini decided that she could live without a man. She found happiness with those slum children. In my opinion, that is a positive ending. Marriage is not the be all and end all. Arangetram was a different case. That was a very acidic subject. I was showing a lower middle-class Tamil Brahmin family where the parents had several children, and the heroine becomes a prostitute to support this family. After showing her as a prostitute for most of the movie, I couldn’t give her a happy ending. In those days – the early seventies – the society was very traditional. I didn’t want to alienate my audience, so I tried to strike a balance between what I wanted to convey and what I thought my audience would accept. If I made the same movie today, she would have lived happily ever after, with or without marriage. As I said, a happy ending doesn’t necessarily mean marriage. These heroines – most of them were hardly the glamour girls of their day. Sridevi was probably the only one. Otherwise, you kept featuring heroines who were more powerhouse performers than pinup girls. It’s almost as if you wanted to prove a point to the box office. Let me talk about Saritha. I auditioned many girls for Maro Charitra, but I didn’t get what I was looking for. They all looked the same, and I wanted someone fresh. Then Saritha came in. She answered all my questions. I told her it’s a very difficult role. She said she could do it. I liked the way she talked to me. I asked her if she would sing, and she got up immediately and started singing and dancing. It was some Telugu film song, and she performed it in the same style as the hero and heroine. She did all this spontaneously. I was taken aback. And I said I’d take her. Everyone around me, including my hero, had reservations about this girl. But I was right about her. Earlier, there was Sowcar Janaki, another performer not exactly known for glamour. I wanted to cast her in a play – Mezhuguvarthi – and I didn’t know if she’d agree, being a popular film star. Finally, ‘Major’ Sunderrajan talked to her and she said yes. That was the first play she did, and she became part of the family. Then I cast her in Edhirneechal, in a total contrast to the parts she was doing then, where she was always in tears. The way in which I spotted Saritha, the way in which I spotted Nasser, the way in which I spotted X, Y, Z – that’s how I spotted them too. Something intuitive happens which tells me, ‘This person will become a star or an actor.’ I cannot define it. The main thing is that they had a lot of potential and could be used in many roles. About using stars after that, it’s again just a question of the comfort factor. They can’t dictate terms to me. They can’t say, ‘I will come at 10 o’clock.’ They have to be there at 8 o’clock. That’s the only way it will work for me. Some of these actors become stars after being in my films, and then they become unavailable to me. If I cast someone, they should be available to me always. You not only got branded a serious filmmaker, you also became known for a certain kind of relationship movie, with permutations of one-versus-many – one husband with two wives, or three sisters in love with one man, or a socially taboo older-woman-younger-man angle. Do you like to shock people? Yes. It’s rather inborn in me that I want to shock people. Of course, it’s risky when you do this, because I’ll have to consider my survival also. If I take on a shocking subject and it fails, then I immediately make a safe film – for the audience. Your serious films deal mostly with relationships. Even in Arangetram, which dealt with prostitution (and perhaps family planning), the overall structure revolves around a woman and her obligations to her family, her relationships. But there was a period where you made Varumayin Niram Sivappu, Thanneer Thanneer, Achchamillai Achchamillai – and in these, the relationships seemed secondary to the social issues. How did that phase come about? That came out of my urge to be different. I wanted to make something different from “my” type of movies. But even then, I never wanted to make fully political movies. I just wanted to touch a political backdrop. I decided to do Thanneer Thanneer the moment Komal Swaminathan said he was writing the play and told me it was the story of a village. It was simultaneously developed as a play and a film. The play was staged earlier and was a big success, but if I’d staged the film like the play – with the village as the protagonist – I don’t think it would have succeeded. The film succeeded because I made the woman the protagonist. I laid emphasis on one particular character and the whole story went along with that character. Achchamillai Achchamillai is also a political subject, but I kept it within the four walls of a house, as a story between husband and wife. Now that we’re talking about Achchamillai Achchamillai, let me ask you about this character named Sudhanthiram – a little person (I think is the politically correct term) whose stunted growth is a metaphor for the state of our freedom. Things like metaphor and symbolism – that “Balachander touch” people keep talking about – do these go back to your theatre background? Not really. I didn’t touch on this issue when I was answering your first question. When I came into films, I was in a dilemma about how best to attract audiences. So I thought of new ways to present things. I wouldn’t call it gimmickry, but it was something like that. This became very popular and the audience gave this a name – the “Balachander touch”. And then it became a must in my movies. They began to expect these touches in my films. Even now, people say they can tell it is my movie after just a couple of scenes – even if they haven’t seen it before. I don’t leave it to chance. I don’t leave it to the music director. I do sit with the music director when he is composing and there are times I’ve even rejected tunes. But all the song situations are dictated by me. Take the romantic song in Varumayin Niram Sivappu – Sippi Irukkudhu. It’s my job to conceive such situations that throw a challenge to the lyricist and the music director, otherwise they will not come up with their best. The song you mentioned, Kannaana Poomagane, was a big challenge, because it couldn’t have many instruments in the background. It had to be simply sung, that is all. In Aboorva Raagangal, I told MSV that the entire climax is contained in a song. In Agni Saatchi, I wanted a song – Kanaa kaanum kangal – that would reflect the state of the heroine’s mind. I knew my shot would start from a close up of her head. So the music reflected that. But it’s different today. Vidyasagar, though, was nice to work with (in Poi), because he’s like someone from the old days. He was very happy that I had come to him, and he was happy to compose for song situations that were very specific. Nothing like that. It’s just a matter of convenience when getting into another language. With a proven subject, it becomes easier for me. A new subject could be a big risk. Yes, redoing something in another language is a big bore. But when I made, for example, Ek Duuje Ke Liye (from Maro Charitra), most of the cast was different. So some amount of freshness was there. Of course, when there’s an earlier movie, there’s always the element of comparison – not only for the viewer, but even I start comparing my shots here with the shots I took in the original version. Sometimes they are superior, sometimes inferior. There are directors like Dasari Narayana Rao, who have done many more films. But in my case, I don’t like to rest. I am 76. How many other directors are still working at this age? That’s because I don’t have any interests other than writing – for films or for serials. For the past ten years, I’ve been busy with my projects for TV. I guess it’s the constant urge to be in the limelight, or maybe to satisfy my own ego. ‘Balachander has not become old.’ That’s what I want people to think. I know this is a clichéd question, but I have to ask you this. What’s your view on Tamil cinema today? And what are the films you’ve enjoyed watching recently? Of course, technically speaking things have improved a great deal. Last week I saw a film that was technically brilliant, technically excellent, technically… you can insert another superlative word. But after coming home, I couldn’t remember what it was about. I couldn’t recall scenes or dialogues that stood out. But some of the smaller films are good, like Chitiram Pesuthadi. I liked the format of the love angle. And there was no bloodshed or violence, despite the Mafia backdrop. I liked the fact that the love affair was treated with significance. (Then, when I prod him about ‘Vettaiyaadu Vilaiyaadu’…) It’s a good movie, very well done, very well enacted and all that. The moment I saw it, I sent for Kamal. He came here and we discussed the film. I was getting bored with what I was doing for the past ten years. If you look at just the writing aspect of it, writing for films and writing for TV are not very different. But with TV, your thinking becomes restricted, mainly due to the budget. For instance, you cannot have a song situation. So I decided to make a film. I consider Poi an antidote to the kind of films coming out today. It’s a simple love story. It’s about the lies we tell in our everyday lives, and how they play havoc with the life of a boy and girl. I think the KB audience will like it because I’ve done things like using a surreal character – like the “conscience” in Moondru Mudichu. Expecting a birthday special post for The Messiah.. I couldn’t but help note that he brought up sarita references. I can never understand his fasination with her esp. compared to several others he introduced. Saawariya or OSO – I think you will end up liking both and I don’t like either of them. Interesting interview with KB. Only you could have thought of these interesting questions. Kudos! BTW, Vellithirai is a remake of the successful malayalam movie Udhayananu Tharam starring Mohanlal, Srinivasan and Meena. It was an awesome film and if the makers stick close to the basic elements of that film, I’m sure it has every opportunity to succeed in tamil too. It’s also the right type of subject for which Pritviraj Prakash Raj and his Duet movies are becoming known for. brangan: I’m glad you asked him about the “Balachander touch.” My flair for that is genetic, not unlike my eyes that everyone and their mother says I got from my dad. (But as far as dad’s physical eyes go, they now help two people in rural Tamil Nadu see, so that makes three of us who now have “dad’s eyes,” but I’d like to think I’m exclusive in my inheritance of the “love the KB touch” gene). @ RAJ: I am looking forward to Vellithirai. But I dont think it will qualify as a real debut on KB’s scale because Viji has Sreenivasan’s tremendous original to work with (Vellithirai is a remake of Udaynaanu Thaaram). What I am looking forward to are the dialogs in Viji’s tamil version and hopefully Prakash Raj rendering Sreenivasan’s original character (The part allows some hamming which is Prakash Raj’s only occasional vice – acting wise.). @ BARADWAJ: The surreal character in Poi was extremely reminiscent of Bergman. The amount of research that went into the interview was obvious. I loved the part on Kannana Poomagane. 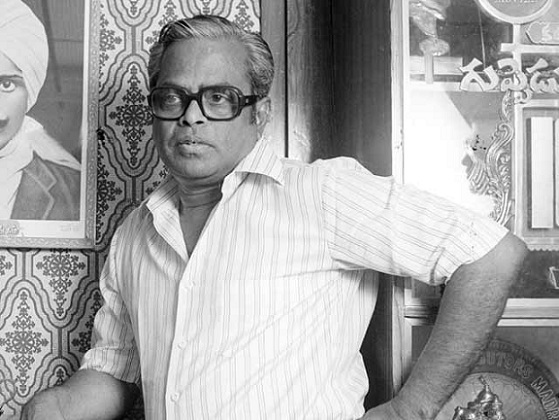 The first Balachander movie I watched was Poi and I was in awe at his screenplay, especially towards the end of the movie which made me end up in tears. Since then I decided to see his previous movies, to see what was special about him. I ended up enjoying every movie which made him my favourite director. My favourite movies are Arangetram and Iru Kodigal due to the incredible screenplay and the strong performances he extracted from the actors. Having always liked comercial films, his movies taught me what filmaking was all about. I haven’t watched his Thaneer Thaneer and Achchamillai Achchamillai which I am dying to see. Really sad to hear of KB’s passing. Reblogged this on vamsha vardhan. After hearing about his death, I came back here to read this interview again. Very sad that he is not around anymore. RIP , KB …a legend lives on . Brilliant interview sir .. found answers for most of the questions which i used to think. He is a grt human film maker and a writer . He is a art lover. Movie craze. Always a lover for his works.